Located on Jamaica’s famous seven-mile beach, this ultimate Beach Resort and Spa is serene and secluded. 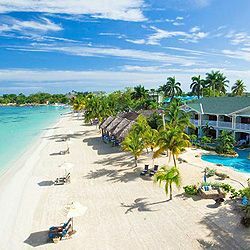 Sandals Negril Beach Resort & Spa is set amongst lush palm groves, powdery white sand beach and the calm aquamarine Caribbean Sea, a must for scuba and snorkel enthusiasts. Negril offers some of the best sunsets in the Caribbean, as well as a myriad of water sports to choose from.